Tension headaches affect over 40% of the UK population at one time or another and are most common in adults, adolescents and predominately female1. They are usually referred to as stress headaches and can appear periodically/episodic (Less than 15 per month) or Chronic (more than 15 per month) and can be experienced as a constant band like pain around the head with tightness or pressure around the forehead, back of the head and neck, as well as pressure behind the eyes. Clear causes are not known it is thought that it’s triggered by a combination of different factors. Some of these factors include poor posture causing increased tension in the muscles of the scalp and neck, Emotional tension, anxiety, tiredness and stress. Treatment for Tension Type headaches include relaxation, massage, regular exercise, stress management and over the counter medication2. The Health professionals in our clinic can help assess your condition as well as give you appropriate treatment such as deep tissue massage, stretches and postural correction. They will also be able to provide you with a home exercise program, give you tips on relaxation techniques as well as give you general advice on how to manage your condition. 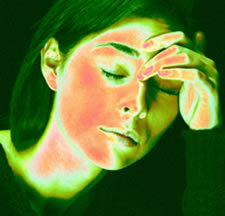 Physiotherapy, chiropractic and osteopathy treatments for headaches are effective and safe. They are also combined with massage for best results. Physiotherapists use joint mobilisations and stretching exercises to retrain the muscles, helping them to fire appropriately. Chiropractors use manipulative adjustment therapy to adjust the joints in the neck that are restricted. They use a very specific and swift adjustment technique for headaches which is accompanied by an ausible ‘popping sound” which is the sound of gas as it escapes from between the two articulating surfaces. Osteopaths use similar techniques to physiotherapists and chiropractors except they tend to use ‘longer levers” in that the style of therapy differs, however results are comparable and effective. Obtaining a good pillow which supports the neck and shoulders while cradling the head is another excellent way to help improve outcome in treatment for neck pain. At Croydon Sports Injury Clinic we provide chiropractic pillows and other posture products to help patients improve outcome. Loder, E., Rizzoli, P. 2008. Tension-type headache, BMJ, 336(7635), pp.88-92.